If there's one thing I know about lab guinea pigs, it's that they're well compensated. Unless they're actual guinea pigs, in which case they're dissected. But you can contribute to science for cold, hard profit in Eve Online. 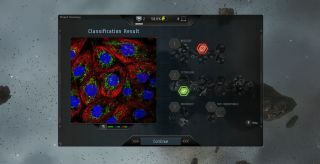 Project Discovery, a collaboration with the Human Protein Atlas, Massively Multiplayer Online Science and Reykjavik University, is crowdsourcing to identify patterns of protein localisation in human cells through an Eve minigame administered by the 'Sisters of Eve', which you can attempt wherever you may be in the universe. In recompense, you get ISK and Analysis Kredits, which can be spent on Sisters of Eve merch in the LP Store. Trolls, be warned: you'll be tested on known samples to define your accuracy rating, and when you move on to the unknown samples, you'll be measured against the consensus achieved by the Eve community at large. If the Sisters of Eve suspect you're doing bad science, don't expect to get much out of them. It's a clever solution to the problem of mass classification, on the part of MMOS and the HPA at least—humans are a darn sight better than machines when it comes to pattern recognition, with the downside of requiring fun and reward, hence crowdsourcing. Whether the players find it worthwhile remains to be seen. Edit: Updated to include key collaborators Massively Multiplayer Online Science and Reykjavik University.